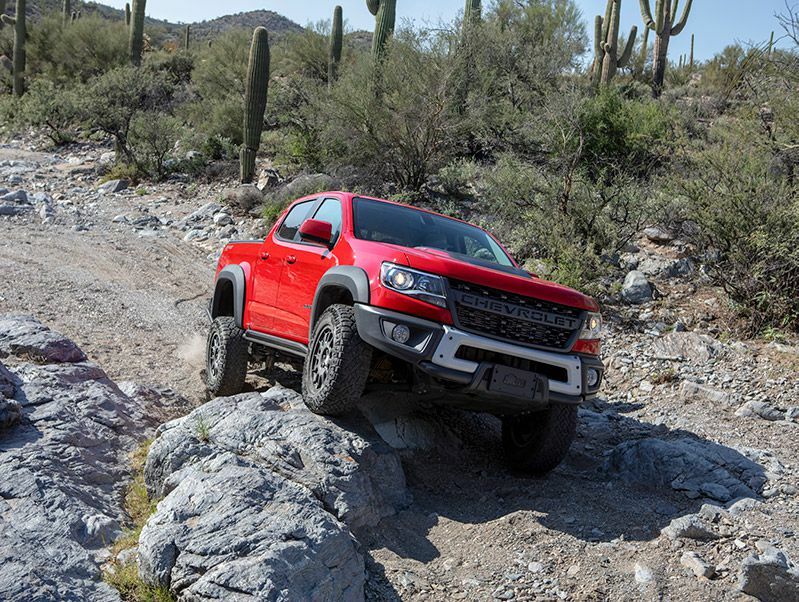 After a few hours on the dusty desert off-road trails outside Phoenix, Arizona, my confidence in the capability of the 2019 Chevrolet Colorado ZR2 Bison had grown to dangerous levels. With its locking differentials, four-wheel drive and special off-road suspension, the truck had conquered the terrain, including a few treacherous rocky climbs, without breaking a sweat. “Let's jump it,” I said to my co-driver. “I want to jump it. You know, like 'The Dukes of Hazzard.' This truck can handle it.” Thankfully, cooler heads prevailed and we kept the pickup’s knobby tires safely on Arizona’s sunbaked terra. 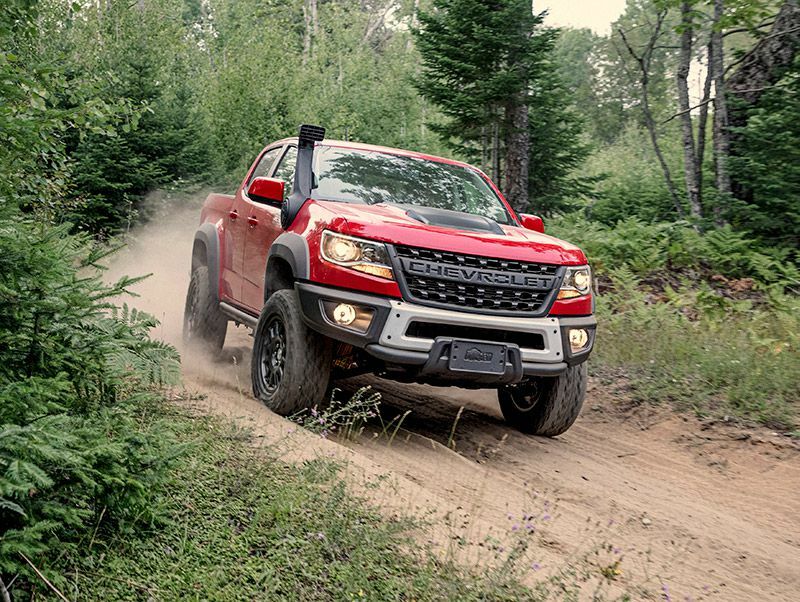 Two-and-a-half years in development, the 2019 Chevrolet Colorado ZR2 Bison cranks up the already incredible off-road capability of the Colorado ZR2, which was first introduced in 2017. When the mid-size pickup reaches dealers early next year, it’ll be the ultimate off-road Colorado, ready to battle the Toyota Tacoma TRD Pro, the Jeep Wrangler Rubicon, and the larger Ford F-150 Raptor. 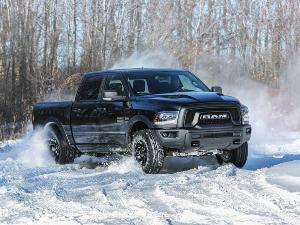 Once abandoned by most automakers, the mid-size truck segment has become a hotbed of activity. 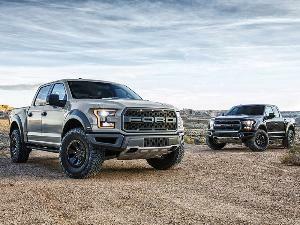 In response to the hot-selling Colorado, as well as the perennial popularity of the Toyota Tacoma, Ford is about to launch its new Ranger and Jeep will soon introduce a pickup version of the Wrangler, called the Gladiator. With a base price of $43,895, including a $995 destination charge, the ZR2 slots above the Colorado's Z71 trim level. Chevy offers the ZR2, assembled in Wentzville, Missouri, in a wide range of configurations. 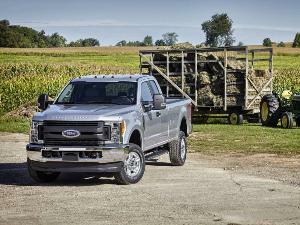 Two body styles are offered: the Extended Cab with a short 6-foot bed, and the Crew Cab with four full-size forward-opening doors and a short 5-foot bed. 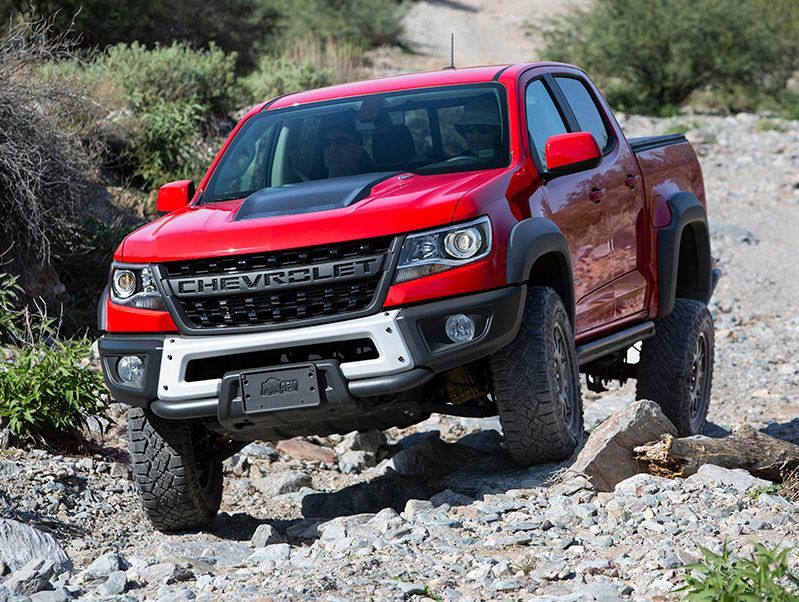 Every Colorado ZR2 gets four-wheel drive with a two-speed transfer case. For extra capability, the ZR2 Bison package costs $5,750. 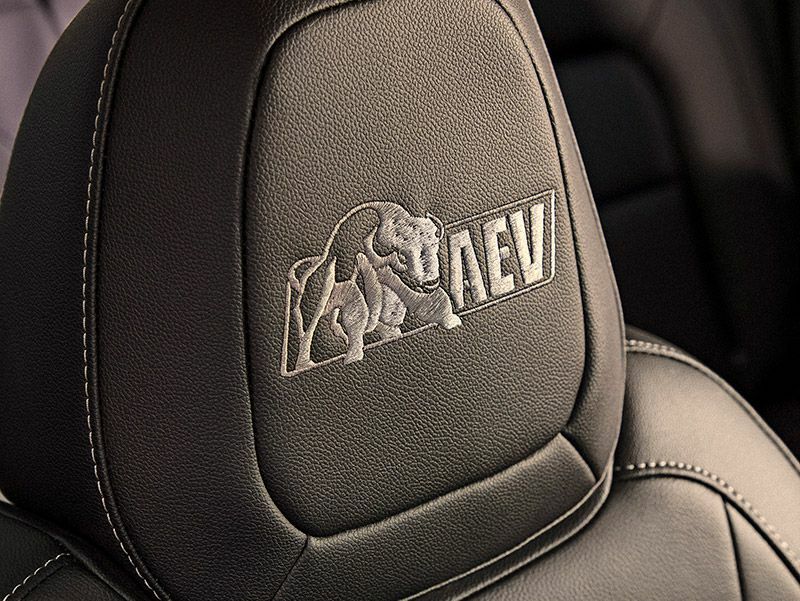 Developed with American Expedition Vehicles (AEV), a Detroit-based aftermarket company, it adds a unique Chevrolet-lettered grille, steel front and rear bumpers, stamped steel skid-plates, AEV-designed aluminum wheels, larger front and rear wheel well flares, AEV-badged floor mats, and AEV-embroidered headrests. 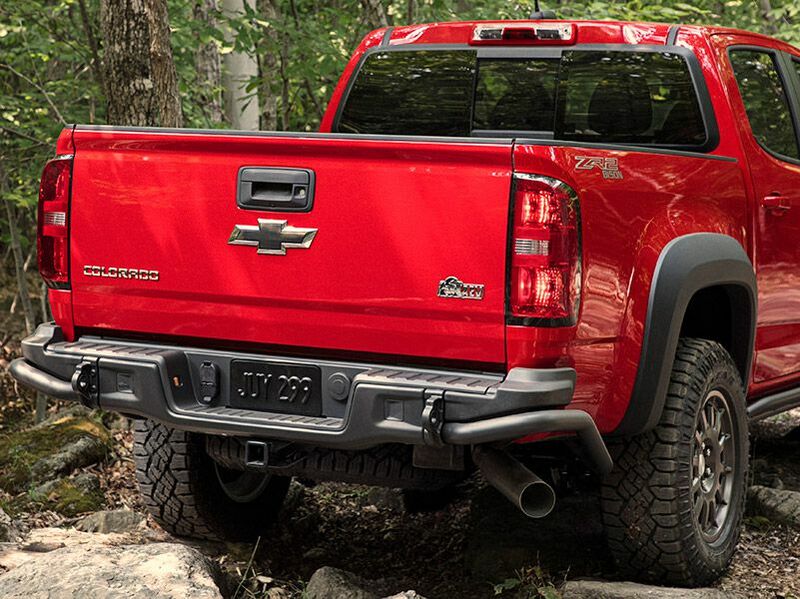 The ZR2 is already considered to have the best off-road suspension in the mid-size pickup truck category, and it's unchanged in the ZR2 Bison. The truck retains its 3.5-inch wider front suspension, which uses different upper and lower control arms from a standard Colorado. It also sits on 2-inch-taller coil springs than the normal Colorado and uses a different front swaybar. There’s an impressive 8.6 inches of suspension travel up front, and the ZR2 is the only mid-size truck available with an electronic locking front differential. In the rear, there’s 10 inches of wheel travel, a locking rear axle, also 3.5 inches wider, and new 2-inch-taller leaf springs. 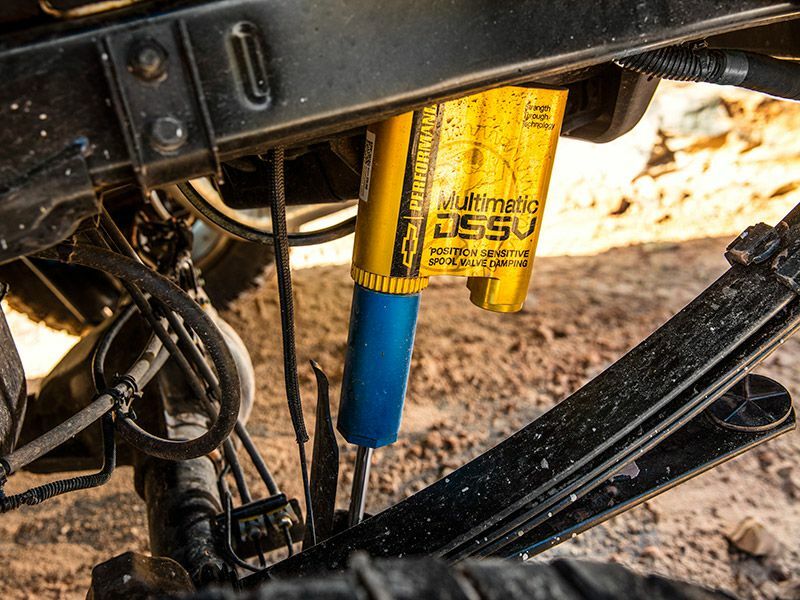 The ZR2’s Multimatic Dynamic Suspension Spool Valve (DSSV) shocks are also unique to this truck and do an incredible job soaking up the terrain both on and off road. Every ZR2, including the ZR2 Bison, rides on 31-inch Goodyear Dura Trac tires. Also unique in this class is the ZR2’s optional diesel engine. The 2.8-liter Duramax diesel four-cylinder costs $3,500 over the standard V6. It develops a light 181 horsepower, but its 369 lb-ft of torque is impressive and peaks at only 2,000 rpm, so there’s plenty of pull off the line. 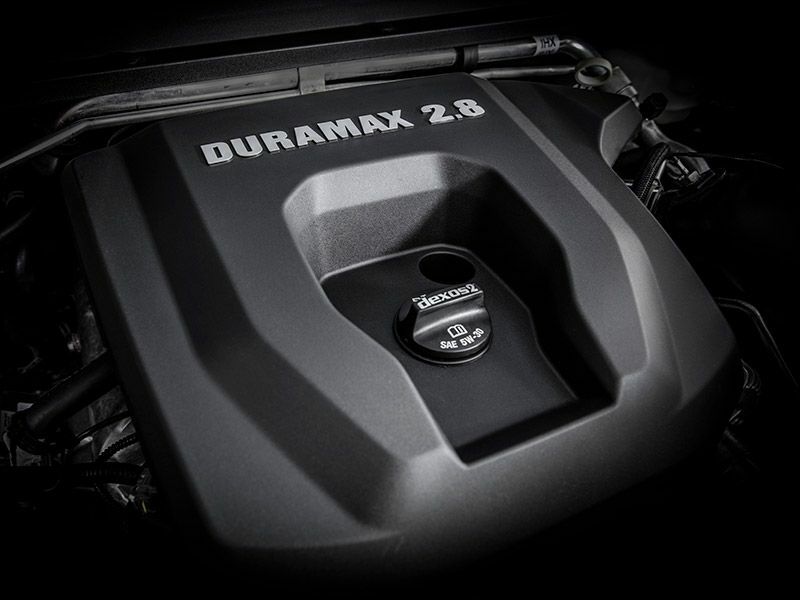 The Duramax is mated to a six-speed automatic and it’s rated 18 mpg in the city and 22 mpg on the highway. Under the hood of our test truck, a Crew Cab Short Box, was the ZR2’s standard 308-hp 3.6-liter V6. Smooth and powerful, it’s mated to an eight-speed automatic. It’s the same combination Chevy uses in the Camaro, and it gives the Colorado more than respectable acceleration. With the V6, the ZR2 Bison is rated 16 mpg city and 18 mpg highway. 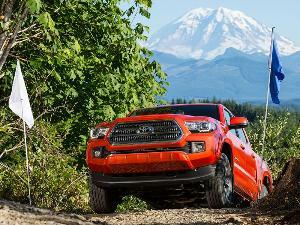 That's not bad, but the V6-powered Toyota Tacoma TRD Pro is rated 18 mpg city and 23 mpg highway. 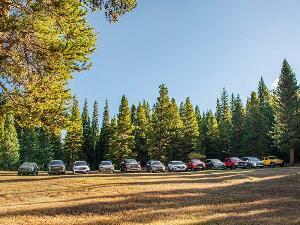 We averaged 15 mpg during a day of mixed driving that included our off-road testing. With its large V6, which is smoother and quieter than the optional diesel, the ZR2 is never short on power. The engine makes 275 lb-ft of torque, so the transmission rarely needs to downshift, even when climbing big, steep grades. The eight-speed automatic is well-tuned and responsive, however, always offering the right gear when you need it. Still, there is a manual control option, so you can hold lower gears when off-roading. In the city, the ZR2's ride is firmer than a typical Colorado and you can feel the texture of its aggressive tire tread as its beefy Goodyears roll over the asphalt. It’s comfortable, but it’s not as cushy as the larger and heavier Ford Raptor. Thanks to its wider tracks, larger tires, and special shocks, which do an excellent job controlling body motions, the ZR2 also handles better than a standard Colorado. On the highway, there’s some tire hum along with some wind noise from around the pickup's outside mirrors, but we would not hesitate to drive a ZR2 Bison cross-country — on or off road. Off road, the ZR2’s suspension travel and articulation are so impressive that this truck can handle surprisingly rough terrain in 2WD, even more with its rear axle locked. And in all-wheel drive mode, with both differentials open, the ZR2 Bison climbs obstacles most trucks can’t handle in low range. With tubular rock rails that tuck up tightly against its body, as well as 30 degrees of approach angle, the ZR2 tackles trails normally avoided in a factory stock truck. And in low range, with both axles locked, this truck climbs like it’s ready for the King of the Hammers. Although we did scrape its rear shock mounts a few times over large rocks, the ZR2’s 11.5-inch and 9.25-inch rear ground clearance are plenty. The ZR2 Bison also excelled on Arizona’s higher-speed dirt roads and over mild whoops and dips. Only the larger Ford Raptor, which has more wheel travel to work with, handles this terrain better than the Chevy. All of that off-road capability, however, does come at the expense of hauling and towing. Due to the ZR2 Bison’s lower rear spring rates, the truck’s maximum payload and tow ratings are down slightly. This is common in off-road package trucks. While the standard Colorado has a maximum payload of 1,267 lbs, the ZR2 with either engine can only carry 1,100 lbs. That's not much, but it's competitive for this class. 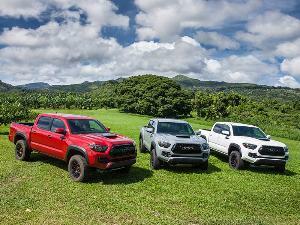 A larger Ford Raptor is only rated to haul 1,200 lbs, and the Toyota Tacoma TRD Pro has a max payload rating of 1,175 lbs. With a tow rating of 5,000 pounds, the ZR2 can also tow significantly less weight than the standard Colorado, which can pull a 7,600-pound trailer. These ratings are the same with either the standard V6 or the optional diesel. For comparison, a Toyota Tacoma TRD Pro can tow 6,400 lbs. 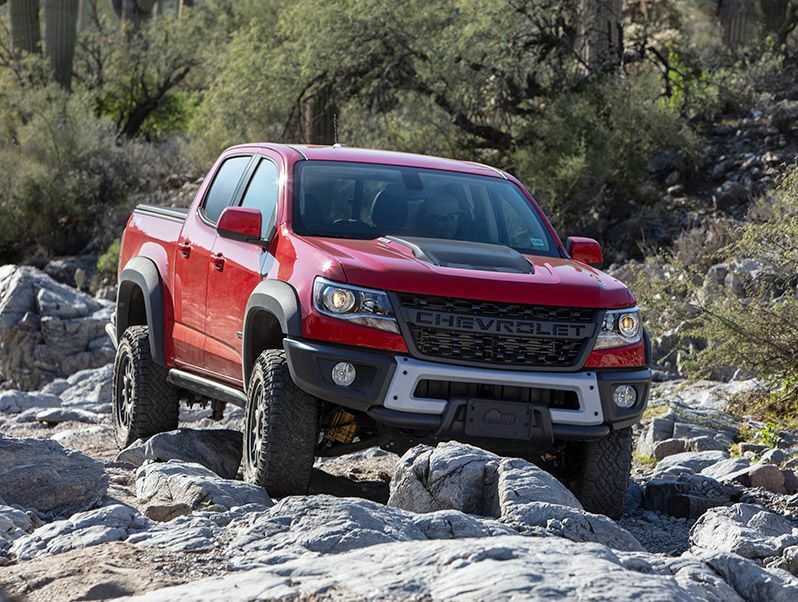 From its reshaped front bumper, which adds clearance, to its bulging hood and flared wheel wells, the 2019 Chevrolet Colorado ZR2 is one of the most aggressively styled in the mid-size truck class. The ZR2 Bison, with its beefy steel bumpers and more pronounced wheel-well flares, amplifies the truck’s rugged good looks. The changes are subtle, but off-road enthusiasts will notice. The Bison package also replaces the ZR2’s aluminum front skid plate with a more substantial steel unit, which can be clearly seen when you’re standing in front of the truck. 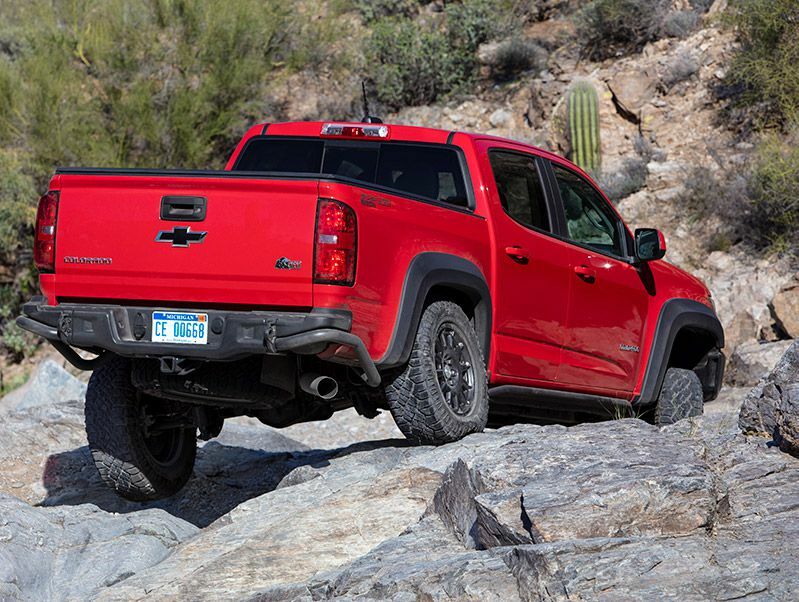 It not only better protects the truck’s engine from rocks and other potentially damaging off-road obstacles, but it also gives the ZR2 Bison a fierce face. I also really like its unique AEV-designed aluminum 17-inch wheels, which have a dark finish and look purposeful. Standard features on the 2019 Chevrolet Colorado ZR2 include leather seats, wireless phone charging, Bluetooth, a power-adjustable driver’s seat, heated front seats, onboard 4G LTE Wifi, a tilt and telescopic steering wheel, remote keyless entry, and an 8-inch touchscreen. Our $50,640 test truck also had the optional seven-speaker premium Bose audio ($500) and a navigation system ($495). Surprisingly, however, push-button engine start is not available. Overall, the interior of the new ZR2 Bison is comfortable and attractive. It’s basically a standard Colorado interior with an extra bank of switches to control the locking differentials and AEV logos embroidered into the headrests. The driving position is perfect and the seats are well-shaped and heated. Fit and finish is very good and there are quality materials. Still, for $50,000, we found ourselves wishing for more. Maybe some special gauges, exclusive trim, or a cool set of sport seats. Back in 2017, Chevrolet blew us away with its exceedingly capable Colorado ZR2. Although comfortable enough to drive every day, the truck set new standards in the mid-size pickup class for off-road capability and cool. And it remains the only mid-size truck, along with its GMC Canyon cousin, available with front and rear locking differentials or a diesel engine. With the new 2019 ZR2 Bison, Chevy has added more visual punch and off-road ability to that already impressive package without sacrificing any of the ZR2’s practicality or comfort. The new ZR2 Bison is just as happy bombing through the desert at 80 mph as it is climbing over the red rocks of Moab or just getting your kids to volleyball practice. It’s the ultimate off-road-ready mid-size pickup.